Tempeh is lesser known than tofu, but is also a soya based product. It is increasingly popular because of its complete protein and fiber content (5g of fiber per 100g). Originally from Indonesia, tempeh is obtained from soya beans, which are cooked, pressed into patties and cultured with a fungus. Fermentation takes place for 24 hours at 30°C: mold then forms and transforms the patties into a compact white-ish edible “cake”. You’ll find tempeh in health food stores, most often frozen in the shape of an 8oz (240g) square. Discover its aromas of mushroom, nuts and yeast with our 5 best tempeh recipes. Tempeh is replacing minced meat in this vegetarian version of the popular American sandwich. As the name suggests, it is somewhat messy to eat, but it is very tasty and always a great hit with children. This quinoa and green vegetable salad is both healthy and exquisite. Marinated in balsamic vinegar and sautéed, tempeh is a protein you’ll want to add to your future salad meals. 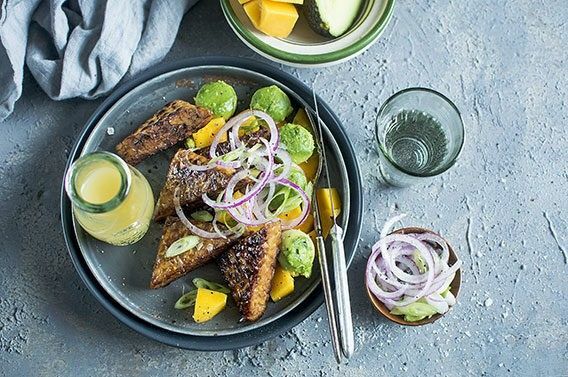 Try this Mexican-American dish with tempeh, you won’t be disappointed. What’s more, you can eat it with your hands, which makes it fun and therefore loved by children. « Time to Take a Vitamin D Supplement!